Two months into the year and I am already behind in my reading. February was an all around slow month. I felt like I was moving through a non-Newtonian fluid most of the time. But we all have rough patches, so hopefully I’ll perk up a bit and get some more writing and reading done. 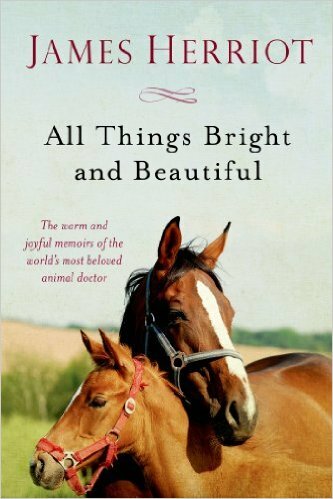 Of all the books I read in February, I can definitely say that James Herriot’s All Things Bright and Beautiful was my favorite (it’s the only book I finished last month). I loved the 1st book in the series and the 2nd was just as good. When I was younger, I wanted to be a veterinarian. Not sure what changed, but reading Herriot’s books makes me slightly regret the shift. I love the outdoors and I love animals, so reading about the rolling hills and green grasses of Yorkshire kind of makes me pine after that lifestyle. John’s always talking about how he would love to move back to Europe. Maybe it’s not to late! The Oscars have come and gone. We ended up making it through 5 of the 9 Best Picture nominees. My favorite of the 5 was Manchester by the Sea. Not a happy film by any stretch but it did feel real, grounded and satisfying. I also got in a few episodes of Star Trek: The Next Generation. Every time I put one on, it just makes me happy. Can’t go wrong with some Star Trek. And I finally watched an episode or two of Supernatural. I was actually surprised that it was kind of creepy and not really cheesy. I plan on slowly making my way through the series. I wish there were more good sci-fi/fantasy programs that were 30 minutes long. It’s difficult for me to justify sitting down for an hour at a time when I could be writing or reading. Many of the shows that I enjoy, John doesn’t like, so I end up trying to watch an episode here or there during the day. Don’t get me wrong— I know John would sit down and watch something I exclusively like, but I much prefer to see something that we’re both interested in watching. My goal this month is to read 5 books and see a few films in the theater. Check by the 1st week in April to see if I’m able to do it.